This glorious little oasis on the southwest coast of the island is a personal favourite after having discovered it a few years back. Built upon and around an old hydro dam on a small peninsula, the Parc des Rapides is a renowned bird sanctuary – with what’s said to be Québec’s largest heron colony. The 30-hectare sanctuary is an important site for migratory birds, with some 225 species passing through each year. No need to be a Birder though, as the sights and sounds of them, alongside the rushing rapids will awe just about everyone who ventures out into the park. A wonderful spot for a short walk, a calming picnic or perhaps even a little ceremony (they have some odd structures & stadium seating type systems in certain places). If you spend only an hour there, you’ll leave feeling refreshed, inspired and calm. 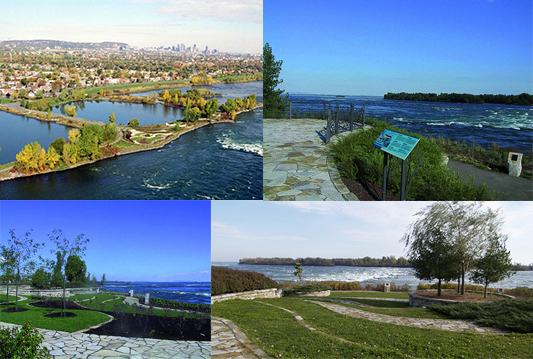 Feels like you have completely escaped the city – The ideal spot for an up-close view of the spectacular Lachine Rapids that first fascinated Jacques Cartier in 1535. It’s pretty easy to get to (public transportation, bike path or car). If it’s raining, there’s very little shelter. There’s lots going on there now (with kayak and SUP rentals, etc), therefore it can get busy on those beautiful summer Sundays. Can be very windy – attache tes tuques! Go ahead, sneak down to the waterfront and dip your toes into the rapids! Although I have been to this park many times in the past, as I’m sure you have as well, this was my first time discovering the Sentier de la Grand Baie. 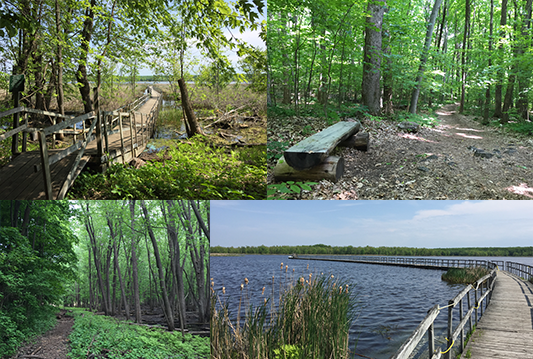 It’s an easy 4km(ish) hike, more or less at ground level, that is typical of southern Québec wetlands, where marshes and silver maple forests rub shoulders. Again, the Birders out there will be in heaven with myriad birds swooping to and fro on the boardwalk and in the wetlands. The sounds of the birds, the frogs and the gentle movement of the bay are enough to warm even the coldest of souls. There is also a great lookout tower you can climb up to scope out the Grand Baie from way up high. Power step up the easy, wide stairs and get yourself a nice little, optional, leg burn. Out on the boardwalk, the breeze that whisks through your fingers, nostrils and other appendages is like a gentle tickle from an otherwise unassuming atmosphere. As well, don’t forget to look around and feast your eyeballs on the wonderful landscape surrounding you upon the Calvaire d’Oka mountain top, in the forests and out on the bay. Last but not least, you must remember my number one rule for hiking: Always take big, bold, through-the-nose breaths as often as you can. Olfactory senses have the greatest impact on memory, and by doing this, these little beautiful moments in the outdoors will be forever seared into the brain things of your head. Sentier de la Grand Baie trail is a perfect family outing due to its easy access, great scenery and changing landscapes. However, most importantly, the little denivelation that exists on the trail is no big deal, even for young kids. If it’s raining, I’d say it’s still ok to head down for a little hike on the trail. The canopy provided by the trees overhead is big, thick and glorious. The boardwalk of course will get you wet but as long as you’re not made of suede, you should be good. Payment is done via the honour system (you grab an envelope in the parking lot, inscribe your party size & date, add cash to the envelope and deposit to lock box). Although this means you have to pay something, I love that the park is being innovative and old-school at the same time with the way they enforce payment. While the price was not outrageous ($17 for my family of 4, including 2 kids under 6 yrs old), and the money goes to a good place, it’s more expensive than free… and I like free. Mosquitoes… oh man, they’ve got some serious skeeters. Down along the waterfront, if you enter into the thicker part of the trail loop heading north, you will run into some heavy duty skeeters. Bring spray or Bounce sheets to help (both of which I did not have this time around). Some of the cyclists on the park roads (not on the actual hiking trail) were a special kind of crazy, screaming and hollering at each other, and at passing cars. I’m not entirely sure what the screams were about, but there were some crazy tight-shorted people out there on La Vagabonde (an over 40-km-long cycling corridor linking Parc d’Oka to nearby municipalities). Since you’ve paid for access to the entire park, go ahead and head down to the amazing Oka beach and laze away the rest of your day lying in the sand, not even giving a care about anything at all. Afterwards go ahead and stuff your face with world famous Oka cheese from the Abbey down the street. You’re welcome.